The Centre and Mrs Iris O’Rourek congratulate Miss Mrunal Hiwase on being awarded the 2018 Paddy O’Rourke Honours Scholarship for prostate cancer research. 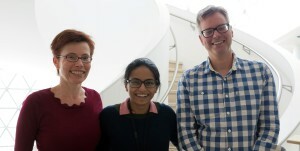 Mrunal, pictured centre with Iris O’Rourke (Paddy’s wife), and Co-Supervisor Dr Andrew Vincent (FFCMH Senior Biostatistician), will be based part-time at SAHMRI and the remainder at the South Australian Prostate Cancer Clinical Outcomes Collaborative (SA-PCCOC) (Flinders) under the co-Supervision of Dr Michael O’Callaghan (Senior Researcher and Educator). Mrunal’s project is “Predicting the likelihood of metastatic disease at the time of diagnosis in prostate cancer“. Numerous “risk stratification systems” have been developed to estimate an individual man’s risk of poor outcomes, and those estimated to have higher risk at diagnosis undergo more intensive screening for disease progression. As Mrunal proposes, many of the risk stratification systems have limited predictive ability and need to be improved. We know a lot more about the disease and have better tools to visualise and diagnose prostate cancer, and importantly we now have large long term Australian data sets such as that from the SA-PCCOC which we can use to make these improvements to improve care decision making and outcomes of men with prostate cancer. We wish Mrunal all the best for her Honours year. This entry was posted in News, Research and tagged honours, MBBS, men's health, metastatic disease, prostate cancer, risk stratification systems, SA-PCCOC. Bookmark the permalink.